Ashley & Carter enjoyed some perfect weather for their Fall wedding at the Brae Burn Country Club in Newton last weekend. 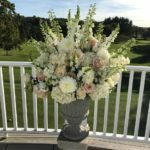 We hope that they had an amazing day and loved their custom floral arrangements such as this pillar filled with lush roses, dahlias and more pastel flowers. Yael & Jason’s Fall Wedding was absolutely beautiful. 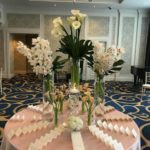 We hope that everyone loved the custom floral designs we created for their special day!